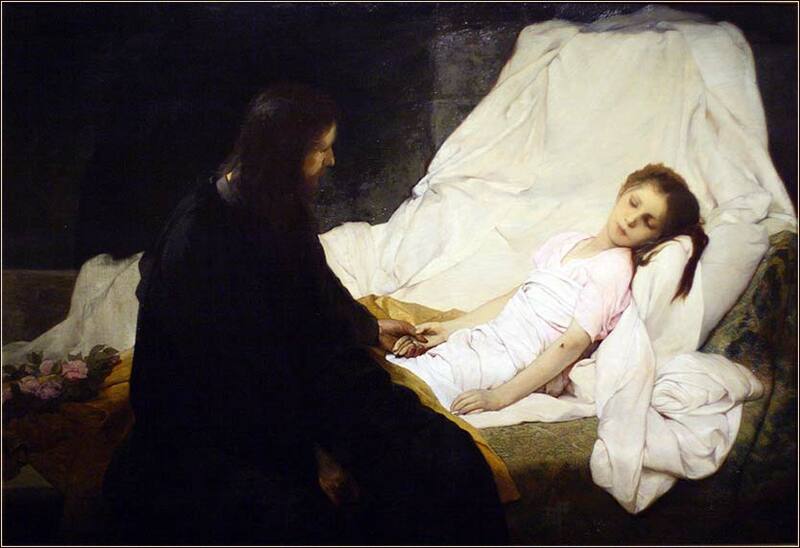 The Healing of Jairus’s Daughter by Gabriel von Max, ca. 1885. 270 people in our community are currently praying with you. "Secret Garden", a Norwegian Christian group, is not as well known as they deserve; they wrote and first performed both this song and You Raise Me Up, Josh Groban’s great hit." Lord Jesus, I have allowed myself to be filled with depression and negativity over what I see as my failures in life, where I have been disappointed in something I wanted from this world. I find myself hiding, full of anger and self-righteousness and self-pity, and have turned my eyes away from you. Give me the hope I need and help me never to be afraid to begin again. You told your disciples to be anxious for nothing. I give to you my anxiety, Lord Christ, and lay my troubles upon your mighty back; and I pick up your burden, for you have promised that it is light, and that you are gentle and kind. Let me work for your glory and not my own, Lord Jesus, that the anxiety that comes from pride and vanity and fear of others might be gone from me, and I may serve you in joy and peace. If you are with me, O God, who can be against me? For I am sure that neither death nor life, nor angels nor rulers, nor things present nor things to come, nor powers, nor height nor depth, nor anything else in all creation, will be able to separate me from the love of God in Christ Jesus my Lord. Daughter of Jairus by Wilson J. Ong, contemporary. The Church is not a gallery for the exhibition of eminent Christians, but a school for the education of imperfect ones. While he was saying these things to them, behold, a ruler came in and knelt before him, saying, “My daughter has just died, but come and lay your hand on her, and she will live.” And Jesus rose and followed him, with his disciples. And behold, a woman who had suffered from a discharge of blood for twelve years came up behind him and touched the fringe of his garment, for she said to herself, “If I only touch his garment, I will be made well.” Jesus turned, and seeing her he said, “Take heart, daughter; your faith has made you well.” And instantly the woman was made well. And when Jesus came to the ruler's house and saw the flute players and the crowd making a commotion, he said, “Go away, for the girl is not dead but sleeping.” And they laughed at him. But when the crowd had been put outside, he went in and took her by the hand, and the girl arose. And the report of this went through all that district. This is a little confusing, because two miracles are intertwined. The passage begins with a ruler asking Christ to heal his daughter. As he walks to the ruler's house, a woman suffering, apparently, from a gynecological problem, touches his hem and is cured. Then we return to the first story, as Jesus comes to the ruler's house and heals his daughter. Both stories are told in more detail in the other Synoptic Gospels: Mark 5:21-43 and Luke 8:40-56. The ruler's name is Jairus and he is a Pharisee, the head of the synagogue in (most likely) Capernaum — for Christ, remember, crossed the Sea of Galilee to cast out the demons into swine, and then returned whence he had come. Thus, the man had more reason to oppose Jesus than almost anyone, at this point. His city has been the center of Christ's revolutionary teaching, and Jairus is the very man most responsible for maintenance of the orthodoxy. But his faith saves his daughter. It is an imperfect faith; Jairus has not listened to Christ and cannot have been converted in his heart: his request is more the last resort of a desperate father. The bleeding woman, similarly, has not truly been converted; it is something closer to superstition that leads her to Christ. She has not taken his teachings to heart or become a follower, but touches the hem of his robe as if it is some sort of magic. Imperfect faith but perfect forgiveness: that is the message. When our own faith waivers and we are critical of our own devotion, this passage teaches us that we can be led to Christ by even shaky or questionable beliefs. There is also something to be said about the two people, a 12-year-old girl (one or two years from marriageable age) and a woman with chronic vaginal bleeding. Many modern feminists bristle at Christianity because of two teachings: that wives should be subject to their husbands, and that women should not teach in church. But the truth is that Christ, for the first time in history, treated women as 100% equal to men. The Bible does teach some gender differentiation in roles, but not in status. To a Jew, a woman became unclean simply by menstruating. The wretched woman in the street would have been the equivalent of a leper. Christ, allowing himself to be touched by her, becomes her servant as much as when he will wash Peter's feet. 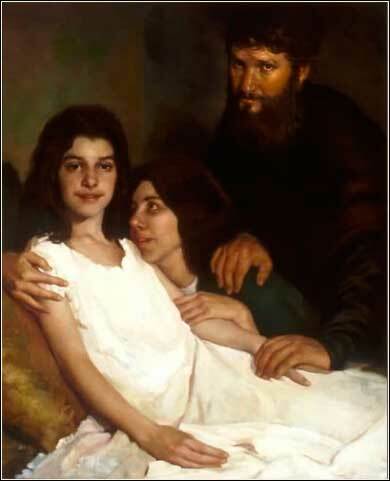 One could write a Ph.D. dissertation on Jairus' daughter, for there are several potent subtexts in the awakening of a 12-year-old Jewish girl. She is, for example, “asleep” in a religious sense, as the daughter of a Pharisee; Christ thus awakens her, not only to consciousness, but to the true and eternal life of salvation. She is, furthermore, pubescent and thus at the age of sexual awakening; one could infer that Christ turns her, as a symbol of womankind, from a child to a woman. Like all girls of her day, her powers as a human being are “asleep” due to the status of women in ancient days (and, we should note, that Judaism itself was much enlightened compared to most other cultures of the time). One might also tie this to the deeply rooted iconic myth of a prince awakening a sleeping princess. Christ often called himself the bridegroom (very much in a figurative sense); many nuns wear a wedding ring. Proverbs 4:18-19: The path of the righteous is like the morning sun, shining ever brighter till the full light of day. But the way of the wicked is like deep darkness; they do not know what makes them stumble.